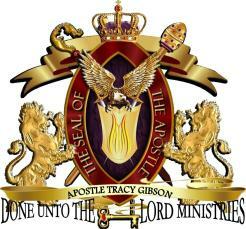 Welcome to the Done Unto The Lord Ministries website and thank you for visiting. We pray that you will be blessed by the ministry of the DUTL family as we give God honor and glory. We are a Kingdom ministry that desires to see the will of God fulfilled in the earth. Done Unto The Lord Ministries is an apostlolic ministry that is anointed to spread the gospel of Jesus through preaching, teaching, taught word and the covering of Kingdom churches and ministries. DUTL has been chosen by God to take His word to the nations and set the captives free. The teachings and ministry of DUTL are powerful and life changing. DUTL believes that everyone has purpose and it is our desire to help others truly fulfill their Kingdom purpose as we release the Glory of God upon the earth. Again, thank you for visiting our site and we bless you and your Kingdom journey.